I’d looked at the work of various artists, in particular, Peter Doig, Daniel Richter and Murat Sahinler, for my cine film project. I hadn’t seen their work first hand. While I was making my catalogue I managed to see Peter Doig’s show No Foreign Lands at the Scottish National Gallery in Edinburgh. I loved this exhibition. Not just because it was such an interesting journey through this artist’s work, but also because it was curated so well. Although the Gallery is emphatically traditional in its architecture, almost underlining that you are in Scotland’s capital, the way this work filled it meant the work really did transport me through Doig’s other lands. The building has huge walls, and this exhibition made full use of the space and light, so I felt caught-up in the fun of working on this scale and with this much colour and variety of texture. There was even a room plastered with his film posters, all made at speed for his local film club in Port of Spain, Trinidad. Doig’s paintings are based on his particular visual experiences and photographs, which is a different perspective than the multi-layered one of my old cine film source. However, I had been selecting frames that I personally found visually exciting, and I often knew as little about the actual narrative of those images as Doig did, for example, when he worked from his photograph for Lapeyrouse Wall. 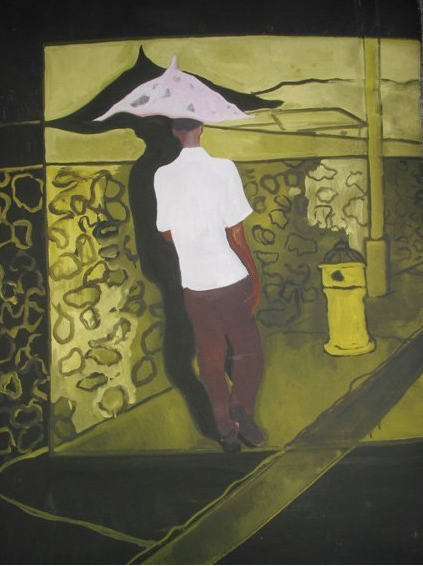 There were several versions of this work in the show. It is one of my favourites. Doig had investigated and experimented with uninhibited gusto in these paintings and sketches. Seeing them made me realise how much more I might have achieved with my own photo-based images. Not in a depressing way – it was a useful lesson for my future work. Peter Doig. 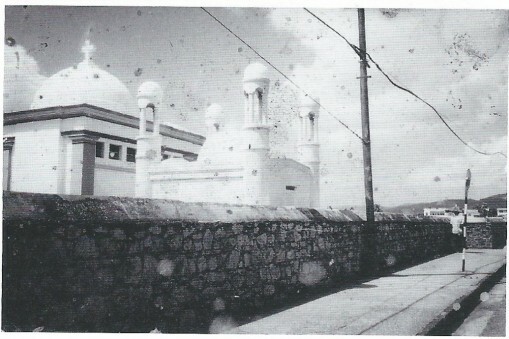 Source photograph for Lapeyrouse Wall, Port of Spain, Trinidad, 2002, from the artist’s archive. Peter Doig, 2004. Oil on paper, 235 x 1229 cm The Museum of Modern Art, New York; Fractional and promised gift of David Teiger in honour of Gary Garrels. 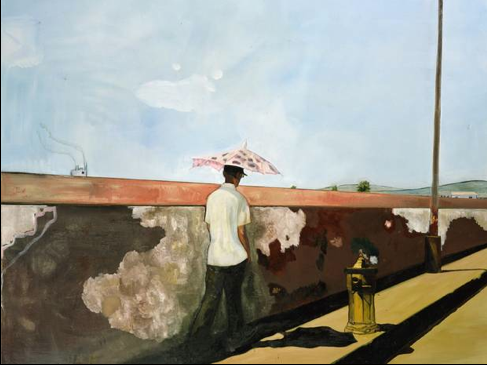 Peter Doig, 2008. 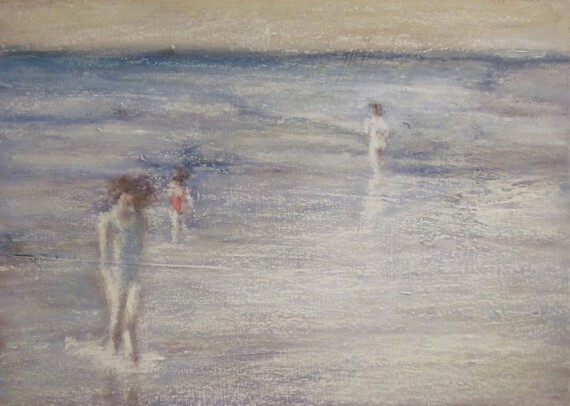 Oil on paper, 76 x 105.5 cm Collection of the Artist. 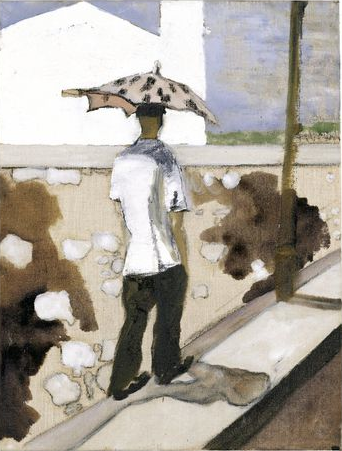 Peter Doig, 2003. Oil on paper, 41 x 31.5cm, Bruno Brunnet & Nichole Hackert, Berlin. 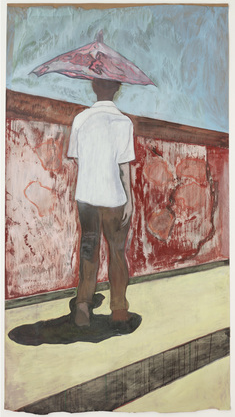 Peter Doig, 2004, Oil on canvas, 200 x 250.5 cm, The Museum of Modern Art, New York; Fractional and promised gift of Anna Marie and Robert F. Shapiro in honour of Kynaston McShine, 2004.